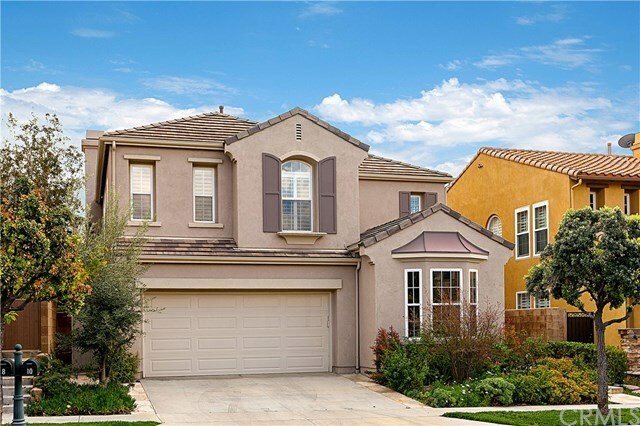 Sophisticated Northpark home located in one of Irvine's premiere gated communities. The home features an inviting family oriented open floorplan with wood floorings, travertine tiles, recessed lights, crown molding, ceiling fans, wood shutters, roller shades and custom built in heated floors with controllers. This beautiful home offers a gourmet chef's kitchen with granite counter & full back splash and is enhanced by a large center island. The family room is equipped with a stylish stone fireplace that flows seamlessly into the kitchen and the breakfast nook area. The gorgeous living room with bay windows, formal dinning room for all family gatherings. The sliding doors off the kitchen nook invites you to enjoy the well designed backyard perfect for entertaining and wraps around to the side. Upstairs to the elegant master suite with dual vanity sinks, power desk, over-sized soaking tub & a separate shower and a walk-in closet. There are three other spacious secondary bedrooms and one of the room currently used as a home office and shares a nicely appointed hall bathroom. 2 car attached garage with ample parking and an upstairs laundry room with a sink and plenty of cabinets. This prestigious community offers resort-style amenities including: pools/spas, tennis courts, clubhouse, parks and nearby award winning schools.